Opening prayer: We fly to thy protection, O holy Mother of God. Despise not our petitions in our necessities, but deliver us always from all dangers O glorious and blessed Virgin. Amen. Reflection: “The stone which the builders rejected has become the cornerstone” (Ps 118:22). “We believe that having died with Christ we shall be raised to life with him” (Rom 6:8). “All who call on the name of the Lord will be saved” (Acts 2:21). Just as individuals are forgiven and raised up by the mystery of Christ’s death and resurrection, we pray with Jesus that “all be given eternal life … and that they will know the only true God, and Jesus Christ whom thou hast sent” (Jn 17). Prayer: Ever-living God, help us to celebrate with joy and thanksgiving the resurrection of your Son, that as he has been raised from the dead, so our mortal lives also may be crowned by the ultimate joy of rising from sin and death with him for ever, who has made all things new. Amen. Intention: We thank God for our Catholic heritage and for the heroic witness of faith of our Catholic Martyrs. May they inspire us in our times of difficulty and trial to remain firm in faith, prayer and to be faithful to Christ and the teaching of the Church. We pray for spirit of renewal and increase of evangelical zeal and missionary outreach for the Church in England & Wales. We pray for the Conversion of England and Wales and of the whole world to Christ and his Church. 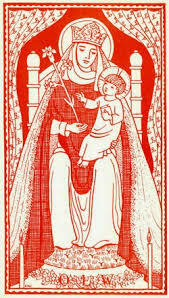 Our Father … Hail Mary … Glory be … Our Lady of Walsingham, pray for us.